Forum of the Heads of the Leading SCO Media Outlets "Towards a Common SCO Information Space"
The news organisations represented at the forum were RTRC Kazakstan (Kazakhstan), Xinhua (China), Kabar National News Agency (Kyrgyzstan), Khovar News Agency (Tajikistan), India Today Group (India), TRT (Turkey), and IRNA (Iran). 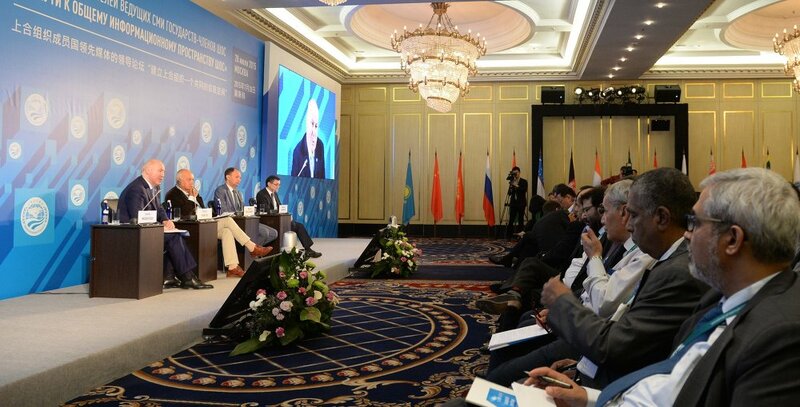 The event was attended, among others, by SCO Secretary-General Dmitry Mezentsev, Russia's Special Presidential Envoy to the SCO Bakhtiyer Khakimov, and Head of the Federal Agency for Press and Mass Media, Mikhail Seslavinsky. The main topic discussed at the forum was how to organise a common SCO information space based on the pluralism of viewpoints and journalistic ethics. As Rossiya Segodnya Director General Dmitry Kiselev said in his opening remarks, the objective was to "promote the idea of a common information space, one so important for our countries, whose population makes up nearly a half of mankind." According to Mr Kiselev, the SCO member states should engage in closer cooperation so as to oppose the information threats they face. "We should exchange the concepts that we use in opposing the information aggression. <...> The idea, at the very least, is to balance the existing mainstream media monopoly in the world," he said. At the end of the forum, the participants approved a joint declaration that reads, in part, "Conscious of the importance of creating a common information space based on the pluralism of viewpoints, the participants will build up multilateral and bilateral coordination in order to inform the international community about the principles and aims of the SCO and its individual members."